The Battle of Stalingrad was a major and the bloodiest battle in the history of warfare, in which Germany and its allies fought the Soviet Union for control of Stalingrad (modern Volgograd) city. Along with the Battle of Kursk, it became the turning point in the course of military operations. After the battle German forces never regained initiative in the East and withdrew military force from the West to replace the losses. The Battle of Stalingrad was politically and ideologically significant. During 200 days of defense the battles were fought for every house and block, the central railway station of the city passed from hand to hand for 13 times. 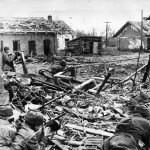 The Battle of Stalingrad ended by surrender of German troops: around 91,000 of ill, starving and wounded prisoners were taken, including 22 generals.